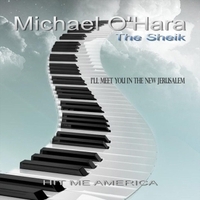 Grammy Nominated Artist, Michael "The Sheik" O'Hara, takes the Hit Me America Challenge as he performs this inspirational upbeat Gospel Jam co-written with the congregation at the St. James Church of God in Christ. Get ready for the ultimate music experience! The HIT ME AMERICA JAM SESSIONS put the audience front and center with gifted songwriter/musicians who have a passion for music and a drive for writing great songs. Imagine interacting with a top artist and actually being part of writing a song, a great song, a Hit Song! Our mission is to take the best songwriters and challenge them to write a hit song with the audience in the most unique and entertaining songwriting session ever. Part story-telling, part songwriting, and part concert, every jam session is an interactive music experience where fans feed the artist ideas, lyrics, melodies, you name it! Hit Me America is the ultimate interactive music experience...an experience you will never forget!